Praat van deurmekaar en nog erger is al die geld wat vir jare “oorbetaal” is, aan wie en om wie te bevoordeel uit die Eskom en selfs ander SOE sages wat “bankrot” speel. Is die spul regtig bankrot of is daar regtig fout met al hierdie kragstasies wat triljoene kos? Is dit regtig swak beplan? Waar is die bewyse daarvoor – want die triljoene is uitbetaal..
Medupi, Kusile badly designed and who were the CEO’s and the millions paid to them? It was reported during 2016 that the Kusile plant, which is a a green-fields, coal-fired power plant located near the Kendal Power Station in Mpumalanga, will comprise six units, each rated at an 800mw installed capacity. It is due for completion in 2022. The plant is the first in Africa to implement clean fuel technology such as flue-gas desulphurisation, a state-of-the-art technology that removes oxides of sulphur, such as sulphur dioxide, from exhaust flue gases. Eskom noted that the connection of Unit 1 of Kusile came at a time when it had been building excess capacity to ensure security of power supply. In addition to Unit 6 of the Medupi power station, which had been operating for more than a year, it had added 1,332mw from all four units of the Ingula Pumped Storage Scheme, as well as the synchronisation of Medupi Unit 5. The statement added that excess capacity had enabled Eskom to increase its electrification target to more than 200,000 households by the end of March 2017, against the target of 169,722 set by the Department of Energy. Eskom said it had also increased electricity exports to neighbouring states, many of whose hydro schemes had been hit by drought. Eskom’s electricity sales to Botswana, Namibia, Zambia and Zimbabwe rose 31.6 percent in the six months to September 30. Eskom’s interim group chief executive, Matshela Koko, said: “Eskom has focused on lessons learnt from its past history of new build projects and this has led to this early synchronisation. Our build programme is now delivering ahead of our re-baseline schedule, our operations have stabilised and, as a result, we are in a position of surplus capacity. The Kusile Power Station project consists of a power station precinct, power station buildings, administrative buildings (control buildings and buildings for medical and security purposes), roads, and a high-voltage yard. The associated infrastructure will include a coal stockyard; coal and ash conveyors; water-supply pipelines; temporary electricity supply during construction; water and wastewater treatment facilities; ash disposal systems; a railway line; limestone offloading facilities; access roads (including haul roads); dams for water storage; and a railway siding and/or a railway line for the transportation of the limestone supply. In February 2011, Esor Franki was awarded the P26 Terrace Underground Facilities contract at the Kusile Power Station in Ogies, Mpumalanga, which consisted of all the interface piping between the bulk supply systems and the terminations to the buildings on the power block, and was mobilised to site in March 2011. The entire contract comprises the installation of drainage systems and high-pressure fire and water supply piping in a range of diameters from 150mm to 630mm for pressure lines, and up to 2 500mm for bulk stormwater lines. The total meterage to be installed in the contract period is in the order of 50km of networked pipe. The balance of the contract comprises the installation of two HDPE-lined holding recycle dams and 10km of in situ concrete networked cable and pipe tunnels. It is the Esor Construction part of the contract that this article covers. When a project as intricate as this is undertaken, challenges are inevitable. Within Esor’s scope of work, the initial design on all the pressure piping systems was going to be PVC, Keevy explains. “However, about six months after we had started, that then changed to HDPE, owing to the longer lifespan,” he says. While this change happened before Keevy joined the project, he muses that the change was initiated by the client, Eskom, through the designers. “In the long run, this was the right decision and will reduce maintenance and replacement costs,” Keevy comments. The arduous project management task fell on the shoulders of the Kusile Execution Team (KET): a collaborative effort between Eskom and Black & Veatch, an American consultancy specialising in engineering, procurement and construction (EPC) services for energy, water, and telecommunications. 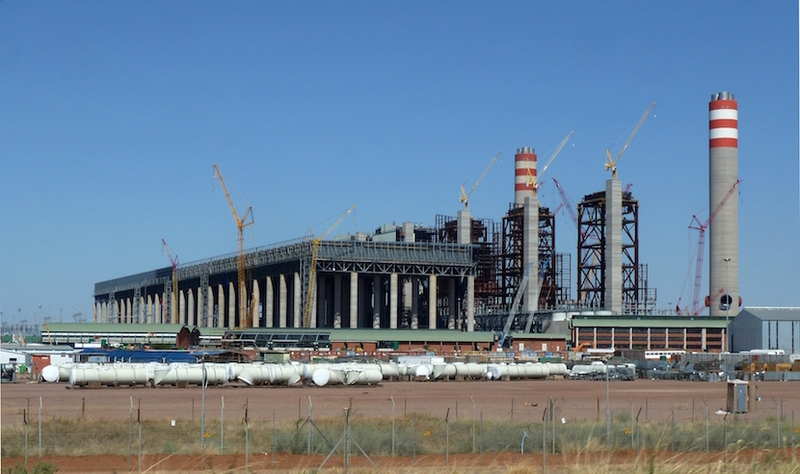 HITACH Power Africa (HPA), a subsidiary of Tokyo-based Hitachi, said it would meet Eskom’s year-end deadline for completion of the first boiler of the utility’s R105bn Medupi power station. Construction of the boilers has been delayed by below standard weldings culminating in the fierce criticism by Eskom CFO, Paul O’Flaherty, who said on July 8 that the performance of contractors “across the board [at Medupi] has been poor”, and were responsible for a six month overrun of the 4,750MW installation. Musel said HPA took full responsibility for its part in the construction of Medupi, which was about 20% of the total project, but he added that “one needs to remain realistic in terms of the current socio-economic environment in South Africa”. “The signing of a partnership agreement between Eskom, the contractors and organised labour is a step towards mitigating these risks nevertheless, site-specific agreements have yet to be finalised,’ Musel said. The announcement today drew the criticism of Doug Kuni, chairman of the SA Independent Power Producers (SAIPP) who said that the real cost of Medupi’s overrun was actually R145bn rather than the R105bn estimated by Eskom. What is in the names and their roles in the Pyramid or Ponzi schemes? Brian Dames is the CEO of African Rainbow Energy and Power (Pty) Ltd (AREP). He is the former Group CEO of Eskom. AREP is owned by Patrice Motsepe (he founded AREP). In December 2018, Brain Dames resigned from the Eskom Sustainability Task Team due to conflict of interest. AREP investment or business strategy is on Generation, Transmission and Distribution. Eskom according to President Ramaphosa SONA 2019 will be broken down into Generation, Transmission and Distribution. Ramaphosa is married to Patrice Motsepe’s other sister. Minister of Energy Jeff Radebe is married to Patrice Motsepe’s older sister. Breaking Eskom into 3 entities exactly matching to AREP’s strategy raises eyebrows. AREP is ran by a former Group CEO of Eskom who was initially in the Eskom Sustainability Task Team raises more eyebrows. The fact that all these decision makers are related is mind-blowing. The fact that Energy Minister Jeff Radebe has refused to release the names of the owners of 27 Independent Power Producers (IPPs) who have entered into multi-billion-rand agreements with government is unscrupulous. One wonders why we suddenly have the “load shedding” again. Is it so that we would not oppose the break up of Eskom as we then all believe that Eskom is incapable of supplying us with constant power. Are we the pawns in the new ANC self enrichment scheme. Ponzi/ Pyramid scheme – it is possible ! what about all other SOE’s?